Georgia and Florida are the only two schools in the Southeastern Conference already set at the quarterback position. They are also the two conference schools who find themselves in the top 5 of all the pre-season polls. Matthew Stafford and Tim Tebow return as established veterans. Look for Stafford to have a breakout year and be the type of quarterback he was projected to be coming out of high school. He has always had the 'tools', but now he has the poise, maturity, and surrounding cast to take his game to the next level. Tebow has shown what kind of numbers he can put up, but at some point one would think that defensive coordinators will challenge him with new looks and schemes to test the guy more. Every other SEC school either has to replace a departed QB or get firmly settled and committed at that position with a guy who played sparingly or inadequately last year. 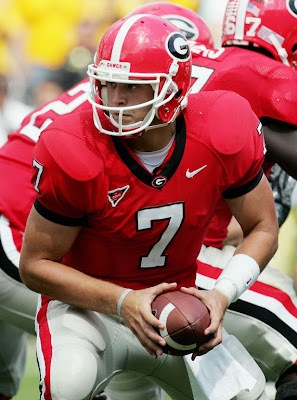 Every school has question marks going into a season, but at UGA and UF the QB question has long been answered.